Gracie has a great veterinarian. I am sorry, but I can't tell you which one she sees. That would get me into a lot of trouble. But, of course Gracie's vet is not only an outstanding professional, but also a great supporter of the Ottawa Humane Society and the humane and veterinary communities in Ottawa. I feel lucky to live in a community where this describes so many veterinarians that you can't likely guess who takes care of our demanding little Siamese. 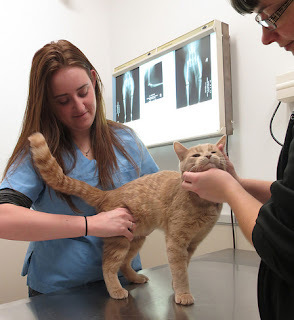 Too many pets, especially cats, don't have a veterinarian. Early disease detection: problems detected in early stages are more likely to be treated and resolved with less cost, less difficulty and better success; detecting problems before they become critical can help avoid unexpected costs. 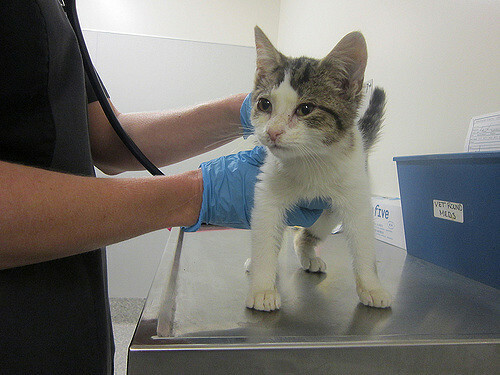 Preventive medicine: vaccination and parasite prevention such as fleas, ticks, heartworm, intestinal parasites, etc. can prevent life-threatening — and very expensive to treat — diseases. Pets should visit their veterinarian regularly. Nutritional counselling: keeps animals in optimal body condition to help prevent obesity related medical conditions such as joint problems and feline diabetes. Detection and prevention of dental disease: veterinarians can suggest various ways of preventing dental disease in your pet as well as perform a thorough oral exam to help detect existing dental disease. Behavioural counselling: veterinarians can offer advice on various behavioural concerns and can help rule out underlying medical causes for these behaviours; sometimes veterinarians will prescribe medications to help with behaviour problems. Your pet's veterinarian is literally a life-saver. Find a good one and take your little friend regularly. She is worth it.